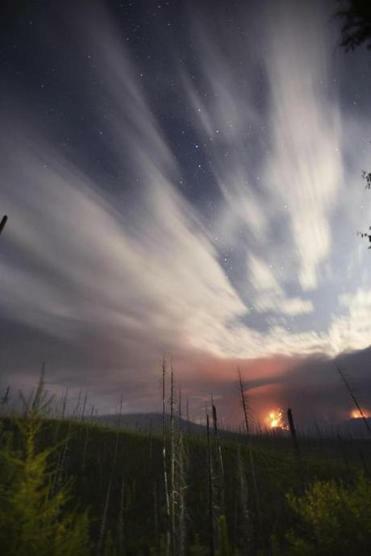 A wildfire in Glacier National Park in Montana early last month. The record temperatures weren’t limited to Montana. The Southwest endured its worst heat wave in decades. Triple-digit temperatures forced the cancellation of dozens of flights at Phoenix Sky Harbor International Airport. It was too hot to fly. And then there were hurricanes Harvey, Irma, and Maria, which disrupted even more travel plans and led to the cancellations of countless others. Let’s stick with those grounded planes for a minute. Why couldn’t the aircraft in Phoenix take off? Jet engines produce less thrust during a heat wave, because the air is less dense, according to Dan Boland, a commercial airline pilot. ‘‘Less dense air equals less power, and when we have close to full passenger loads it becomes almost impossible to safely take off at temperatures above 100 degrees,’’ he says. The temperature increase has ramifications on land as well. Earlier this year, Jessica Pociask, an ecologist and the founder of Want Expeditions, a tour operator, had to cancel a tour to view harp seals in the Gulf of Saint Lawrence because of a lack of ice. ‘‘Climate change is having a massive impact on travel,’’ she says. Phyllis Stoller, who heads a tour operator called the Women’s Travel Group, says her business has also been affected by changing weather. She recalls her first March trip to Ethiopia nearly six years ago. Back then, at the higher elevations, the temperatures were cool. Two years later, she says, there was no relief from the heat, even at 10,500 feet. ‘‘We changed our dates for the next Ethiopia tour to accommodate this change and are planning it for a winter month,’’ she says. Micha Wacquier, a tour operator, has faced similar challenges with his trips to South Africa’s Kruger National Park. The threat of global warming also should influence where you go. Greg Geronemus, the co-chief executive of SmarTours, a tour operator, says more of his clients are asking him about ‘‘last chance’’ destinations that are threatened by climate change. It helps to understand your rights when an extreme weather event delays your trip. Many travel companies have ‘‘Act of God’’ clauses that let them off the hook for weather-related delays or cancellations. That fine print is in the airline’s contract of carriage or in your cruise line’s ticket contract, and it essentially means the company can cancel a trip without having to cover any of your expenses or even get you to your destination. A good travel insurance policy can make your trip go a little smoother — whatever the weather.